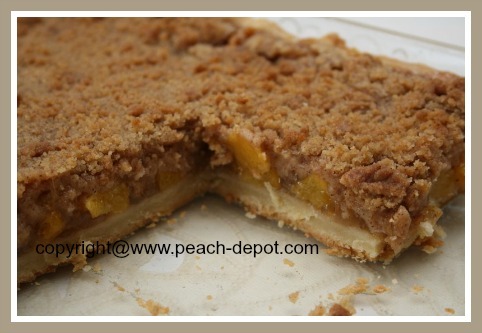 This Fresh Peach Slab Pie Recipe is the best of both worlds, it's like a flaky crust crumble, deep dish peach pie dessert made in a 9" x 13" baking dish. 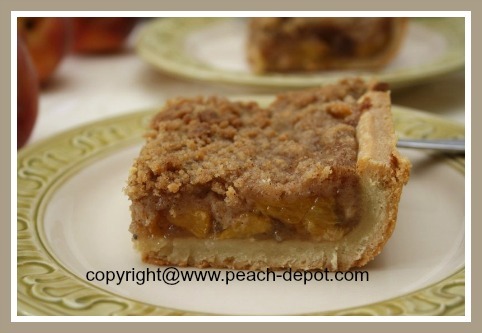 If you LOVE the idea of a peach pie with a streusel type crumble topping - this is the recipe for you! 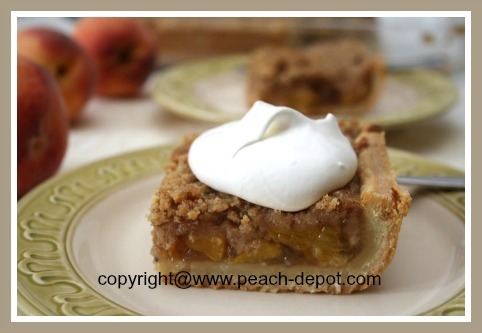 This recipe will work very well with nectarines instead of, or in combination with peaches. 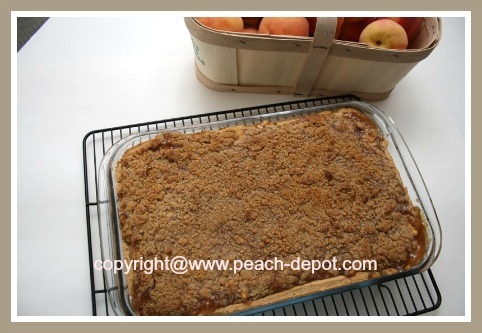 Make a Yummy Peach Slab Pie in a 9" x 13" Baking Dish! 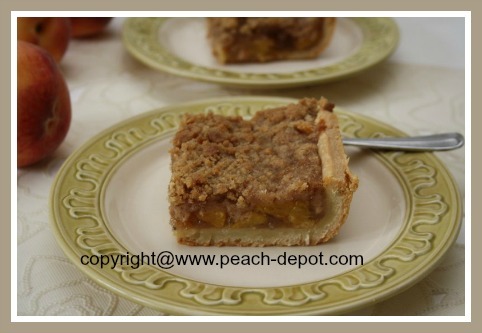 You will love how easy it is to make this slab pie! You can make it all at once - serves 12 to 16 - without having to roll out the pastry for two separate traditional pies. And ... it's so easy to transport to a picnic or event in a sturdy baking dish! 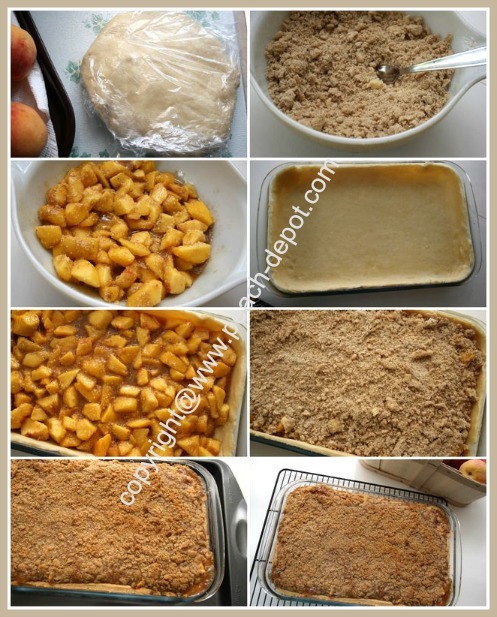 Note - If desired, you can make the pie dough and crumble topping a few days before and store them in the fridge until you are ready to make the slab pie. In a large bowl, whisk together the flour and the salt. Add the butter and, using a pastry cutter, mix until the mixture forms small pieces. Add the ice water, one tablespoon at a time, and mix until the mixture is just moist enough to hold together. Form the dough into one ball, and flatten to a disc shape. Wrap the dough in plastic wrap and refrigerate for at least one hour. Roll out the dough using a lightly floured rolling pin, to a rectangle about 11" x 15". If dough is "sticky", dust with additional flour. Fold the dough in half and transfer it to (no need to grease the dish), 9" x 13" baking dish. Carefully press the dough into the bottom of the pan, and up the edges to make it even with the top of the baking dish. Return the crust to the fridge while you prepare the filling and topping. In a large bowl, add together the peaches, brown sugar, tapioca, lemon juice, nutmeg (optional), vanilla and the salt, toss, and allow to stand for about 25 minutes. In a bowl, whisk together the flour, brown sugar, cinnamon, ginger (optional), and the salt. Add the cubed pieces of butter, and mix in using your fingertips until the mixture is evenly moist, and has formed large clumps. Spoon the filling into the crust in the baking pan, and top with the crumble. Place the baking pan on a baking sheet (cookie baking sheet). Bake for 15 minutes at 425° F on the lowest rack of the oven. Then, reduce the oven temperature to 375° F and move the slab pie (and the baking sheet) to the center rack in the oven. Continue to bake for about 1 hour, or until the pie is golden brown and the filling is bubbling. Remove the pie from the oven and allow to cool before dividing into portions. Serve warm or cold, plain, or with a dollop of whipped cream or ice cream! So Deliciously Delicious!